I love building elaborate Halloween costumes. I've always been pretty decent at building stuff, and while I was at the University of California at Santa Barbara, I discovered the thrill of hoisting around an oversized contraption, corralling a huge amount of attention. This year I decided to build a Fandango Paper Bag hand puppet costume. The fandango paper bag hand puppets are featured in those poorly received commercials that precede movies in the theatre. The paper bags work for fandango.com, an online movie-ticket seller. In any case, the bags are really cute and have a lot of personality. 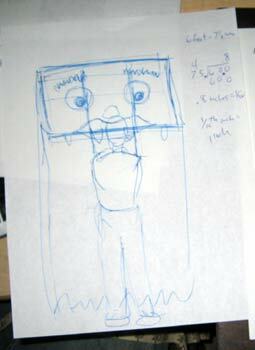 I began planning a large paper bag costume, supported by a backpack frame. I figured the bag would be about seven feet tall, with a face rectangle measuring 42" wide by 24" tall. I initially planned on being the "surfer dude" hand puppet from the commercials, pictured above, with huge starfish hair and candy necklace. However, trolling the aisles at Michael's for a giant seashell nose, Stacy mentioned that I might do better if I created a Halloween-themed paper-bag character. She was right! A fandango vampire would be perfect! The trick with making good fandango characters seemed to be to use items related to the character for the puppet's features. Such as starfish for surfer hair or conversation hearts for a lovestruck girl's buttons. So, the best stuff to build the big vampire with would be giant versions of tiny things that are related to halloween, and look like facial features. It turns out to be harder than it looks. These are design sketches by the way. To build a giant paper bag, I talked my boss out of several dozen yards of brown kraft paper. We use this paper as packing material, but it would be PERFECT for building a supersized bag. My costumes always have a backpack for support, so I visited the mega Deseret Industries building on Auburn Blvd.and found this castoff for $3. I also bought 250 stuffed animals and opened my own carnival midway. Also on the shopping list were nylon zip ties, pvc pipes and connectors, and some long screws. please continue reading page 2 of the fandango costume.